This lesson uses De Bono’s thinking hats to look at where people have settled and why. Pupils use different thinking hats on the thinking hat frame whilst looking at different images around the world (thinking hats images). They then use the thinking.. This presentation allows you to run through elements of the lesson for the class, as the images are contained within the frame. It works well with lower ability groups or where colour photocopying may not be possible. 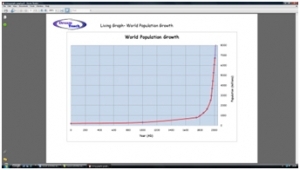 These resources focus on population growth and the reasons for it, using living graphs. There is a population growth presentation which highlights just what an issue it is at present. 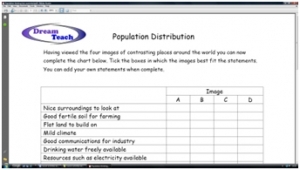 Pupils then try to place the statements about population growth on.. These are the statements that pupils place in the relevant place on the living graph. 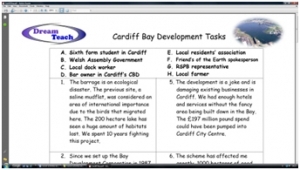 3) Land use- Cardiff Bay thinking skills task. This is a skills based exercise that looks at how the Cardiff Bay area has developed from docklands into a modern commercialised area. There are 8 statements by a range of people about the developments and pupils have to follow the instructions..